Hi all - this is the only retreat we will be doing in 2017. Our partner The Woodlands Hotel are offering €95 Euros B&B for two adults sharing - that €47 each!? So you could stay the evening before or after. 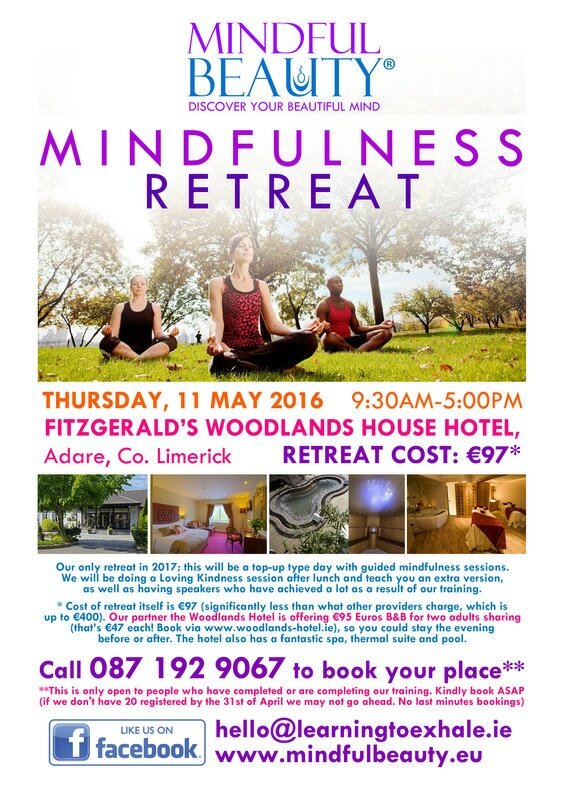 The cost of the retreat itself is €120 (97+VAT) and this is significantly less than what other providers charge, which can be up to €400. The hotel also has a fantastic spa, thermal suite and pool. We will be doing a top-up type day with guided mindfulness sessions. We will be doing a Loving Kindness session after lunch and teach you an extra version. 3:10 Loving Kindness - The Ho'oponopono Mantra - This simple and powerful approach to healing engenders self-compassion, powerful healing and forgiveness in oneself and others. It is based on ancient shamanic Hawaiian wisdom (Ho’oponopono): By taking 100% responsibility for the creation of our reality, and with sincere regret of what was created in ignorance, we petition to the Divine to uncreate it, out of the acceptance of forgiveness arises love, for the Divine, for self and for others, and gratitude for the healing received. Love and gratitude restore the alignment with our true nature.